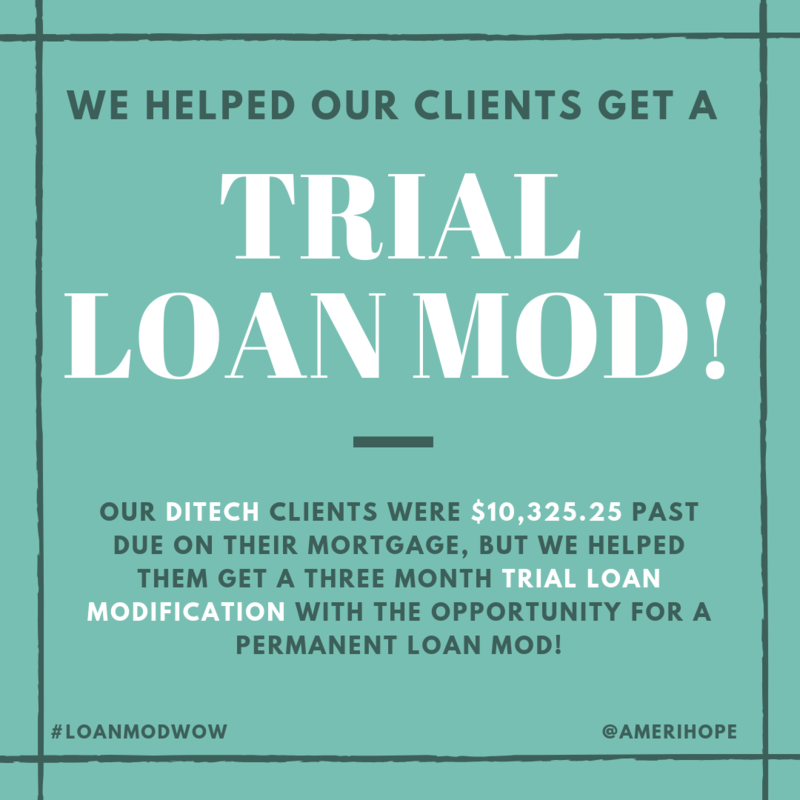 Our Ditech clients were $10,325.25 past due on their mortgage, but we helped them get a three month trial loan modification with the opportunity for a permanent loan mod! 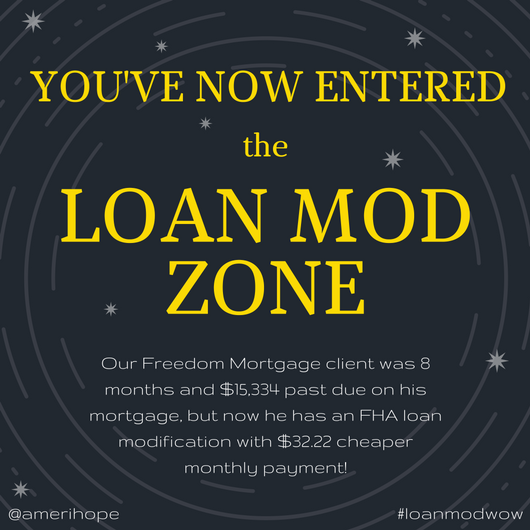 Our Freedom Mortgage client was 8 months and $15,334 past due on his mortgage, but now he has an FHA loan modification with $32.22 cheaper monthly payment! 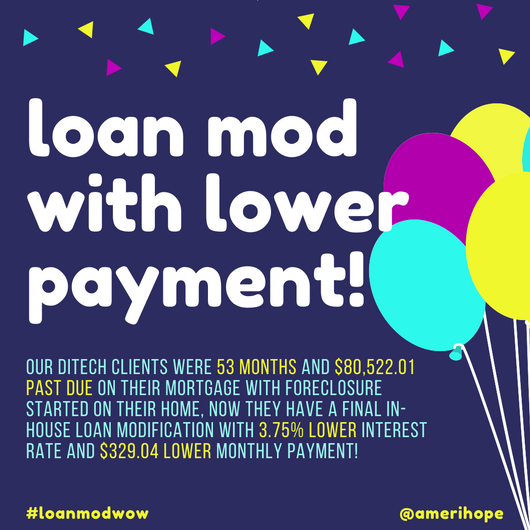 Our Ditech clients were 53 months and $80,522.01 past due on their mortgage with foreclosure started on their home, now they have a permanent in-house loan modification with 3.75% lower interest rate (from 7.75% to 4.0%) and $329.04 lower monthly payment! 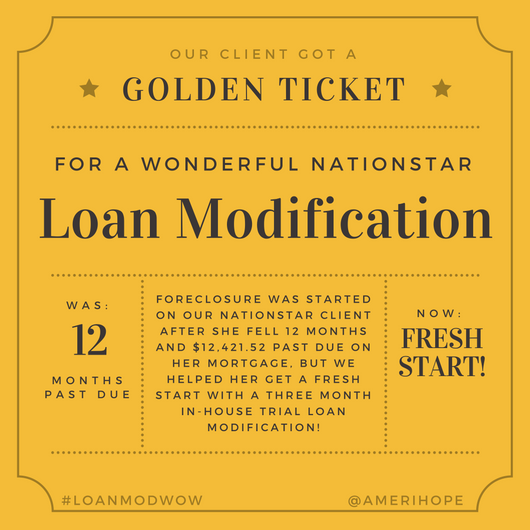 Foreclosure was started on our Nationstar client after she fell 12 months and $12,421.52 past due on her mortgage, but we helped her get a fresh start with a three month in-house trial loan modification. If she keeps up her payments, we hope to have her in a permanent modification by Easter! 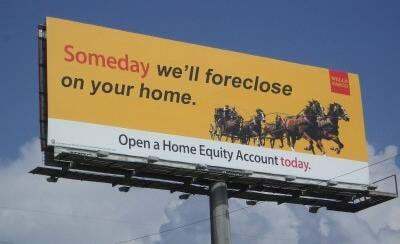 Our Nationstar clients were $28,107.72 past due on their mortgage payments, but now they have a final loan modification with the entire past due amount deferred and monthly savings of $224.03 (24% reduction)! 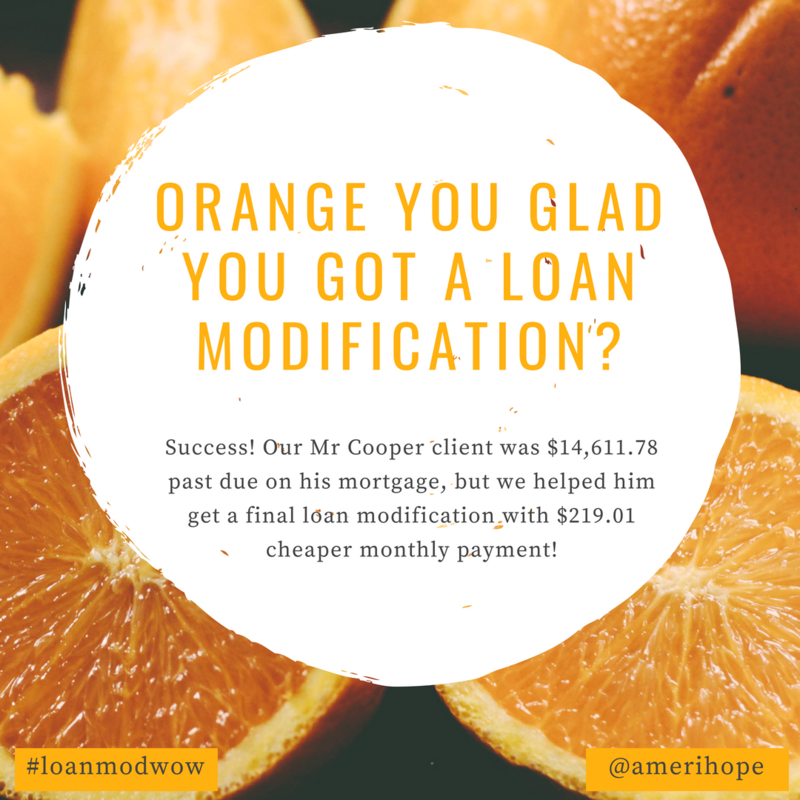 Our Client Was 98 Months Past Due with Ditech and We Still Got Him a Loan Modification! Disclaimer: These results should not be taken as a guarantee, as each case is unique. We have helped over 7,000 homeowners, here is one of their stories. 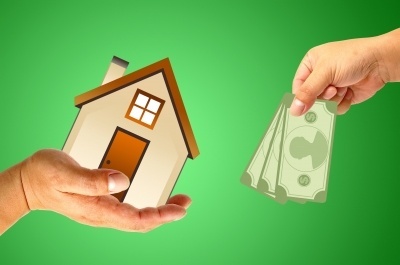 Being really, really, really far behind on your mortgage doesn't necessarily mean that you can't get a loan modification and keep your home. A recent client of our firm is a good example of this. To protect his privacy, I'll call him Mr. Shroff. Mr. Shroff lives in a nice home, currently valued at about $1 million, in Hilsborough County, FL with his wife and son. He is self-employed. 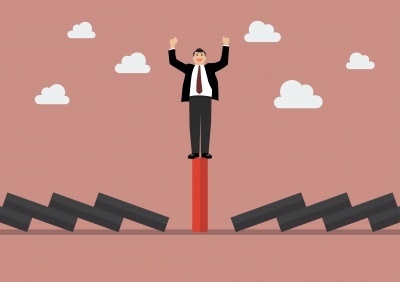 A downturn in his business caused him to fall behind on his mortgage during the recession in 2009. 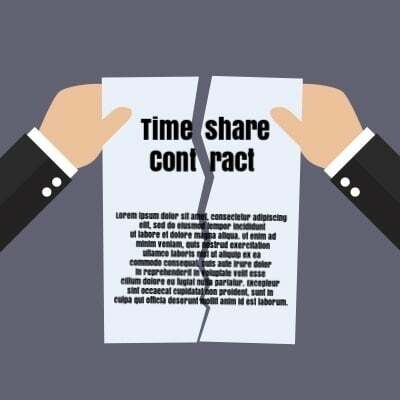 Eventually Mr. Shroff's financial problems cleared up and he was able to make payments again, but by then, his mortgage servicer, Ditech, wouldn't let him make payments. They wanted him to pay all of the missed payments plus fees, which ended up being an astounding $191,140.06. He didn't have that much cash, so he stayed in default. Great success! 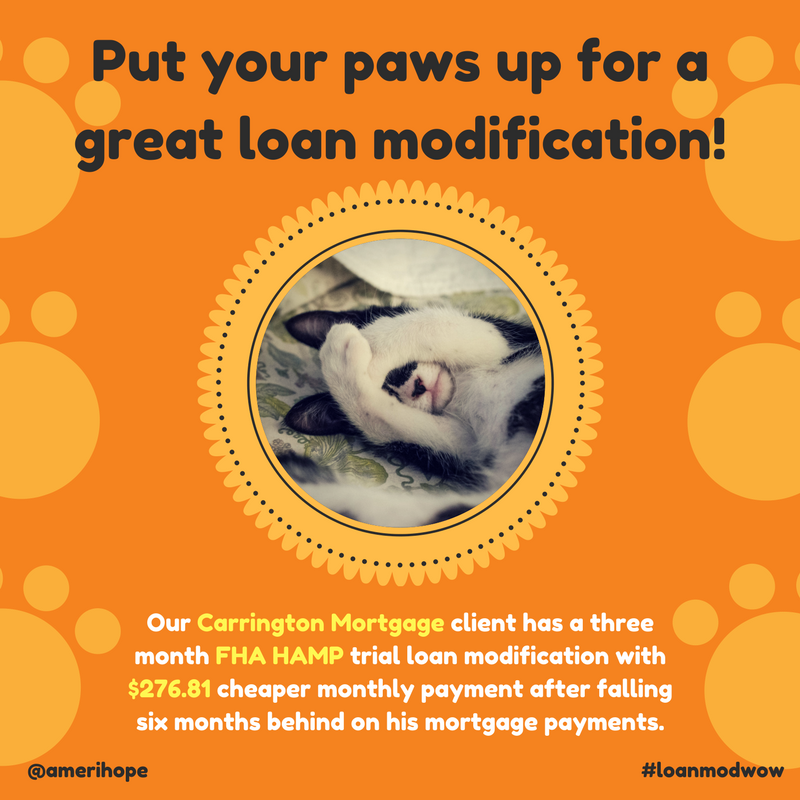 Our Carrington Mortgage client has a three month FHA HAMP trial loan modification with $276.81 cheaper monthly payment after falling six months behind on his mortgage payments. 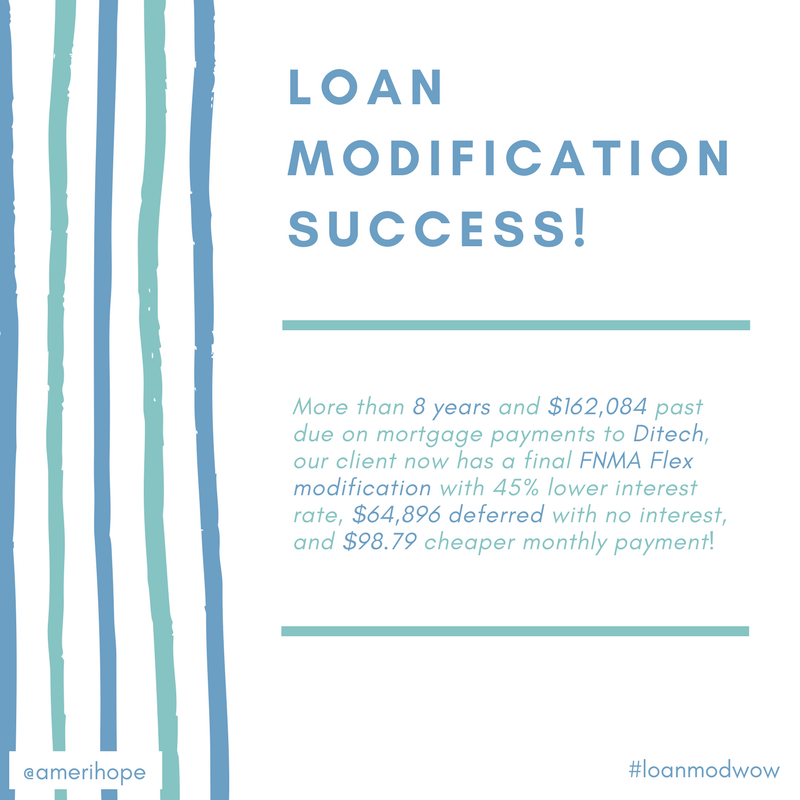 More than 8 years and $162,084 past due on mortgage payments to Ditech, our client now has a final FNMA Flex modification with 45% lower interest rate, $64,896 deferred with no interest, and $98.79 cheaper monthly payment! 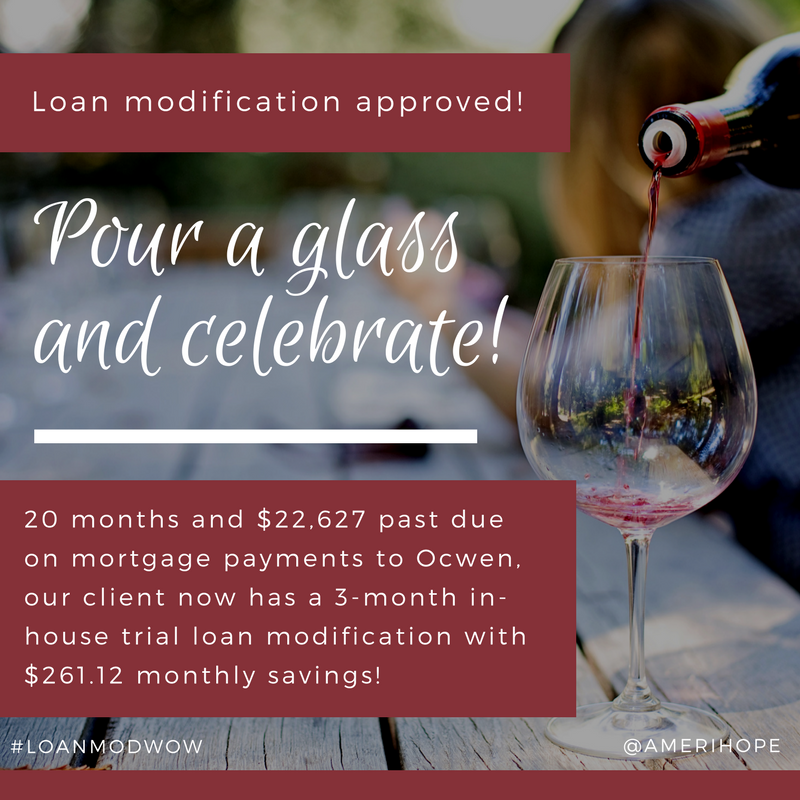 20 months and $22,627 past due on mortgage payments to Ocwen, our client now has a 3-month in-house trial loan modification with $261.12 monthly savings! 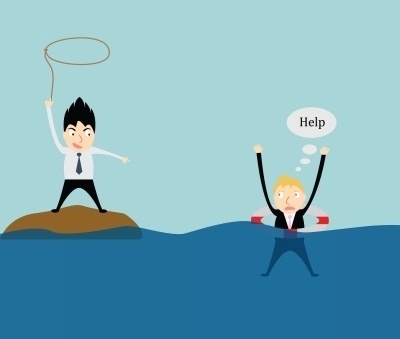 Getting your bank's approval for a trial loan modification is often difficult, but once you get it and make the payments, your permanent loan mod is basically a slam dunk, right? In some cases it doesn't happen so easily. A recent client of our firm, who I'll call Mr. Smith to protect his privacy, is a good example of that. 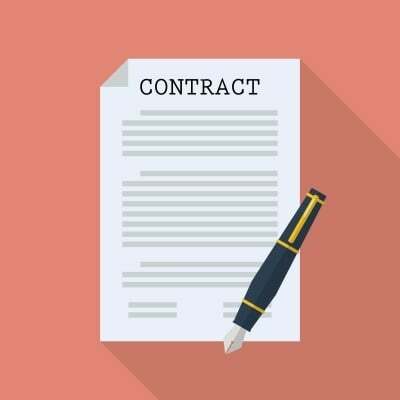 Mr. Smith made his trial modification payments on time and in full, and wasn't offered a final loan modification like he was promised. 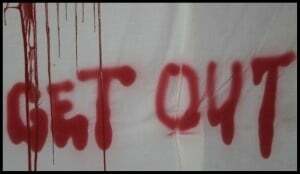 Let's look at his story and what lessons can be learned from it.